I find making fine art prints to be far and away the most satisfying aspect of photography. While visiting beautiful wilderness areas is its own immeasurable reward, the creation of a fully visualized print is the only tangible expression of fine art photography. I enjoy the process and results of enlarging to any desired and practicable size with commonly available silver materials, and reasonably transportable cameras. It seems that all that I want to communicate artistically (or perhaps that which is communicated through me) is both possible and fulfilling with traditional silver enlarging techniques. There is absolutely nothing revolutionary or proprietary about my methods. One will find everything he/she needs to print effectively in the The Print and The Negative, both part of the New Ansel Adams Photography Series. These books form the nucleus of what is essentially the bible of silver based photography. While it may be true that many people have found these books to be difficult to digest, they contain all one really needs to know about the subject. The writings can be terse for the beginner, but time spent with these references will pay dividends. In fact, I still find the answers to seemingly insoluble darkroom dilemmas within a sentence or two of Ansel's compact writing style. It is these very techniques that were taught in most beginning high school and college photography classes during the past 30 years – admittedly, to the chagrin of many budding artists. There are a multitude of wonderful alternative printing techniques (e.g., platinum/palladium, collodion, daguerreotypes, etc.) 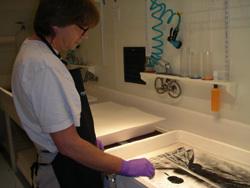 being revived and practiced by many talented darkroom artists. Most of these produce final photographic art pieces no larger than the original negatives, and while ever larger specialty film cameras and digital internegatives are used to address this limitation, they also introduce a host of other issues inherent to their size. I use relatively simple darkroom equipment and procedures to execute my vision and produce an expressive print. I don't use "heroic" methods in order to print "difficult" negatives. Truthfully, I have far too many good negatives yet to print to waste time attempting to whip bad ones into shape – this despite the fact that many landscape opportunities are fleeting in nature. Better to look forward to revisiting a favorite location to experience the thrill of a thunderstorm in the high country all over again! Lastly, please remember, the techniques I use suit the way I print. Every photographic artist is free to print any subject in any manner they wish. Please visit Techniques for the intentions and methods I use to make and present silver darkroom prints.